Hello! More blues from me, haha! 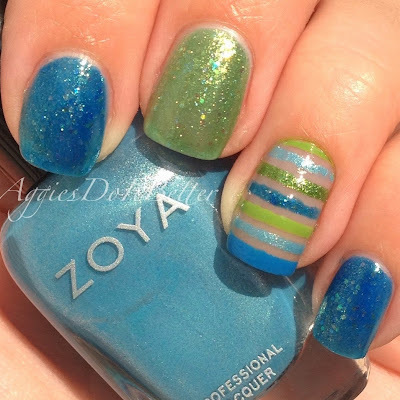 In continuing with my project to use the polishes I have (and not buy any more) I was rummaging through my Zoyas picking out blues and greens, several of which I still have from the Earth Day Sale I haven't even used yet! I'm also trying to work down my list of new and different techniques out there that I haven't done yet. One is called "negative space" , where you basically leave unpainted areas on your bare nail. I've always been kind of on the fence about this, because I'm not a big fan of VNL (that's nail code for visible nail line, hahahaha!) So I knew if I did it I'd have to think of a way to cover that up. The solution? Stripes! I do love me some stripes! I used a ton of polishes for this! On my main fingers the blue is Zoya Muse and the green is Zoya Stassi, from the summer Tickled Collection I was sent earlier this summer. Still loving them! 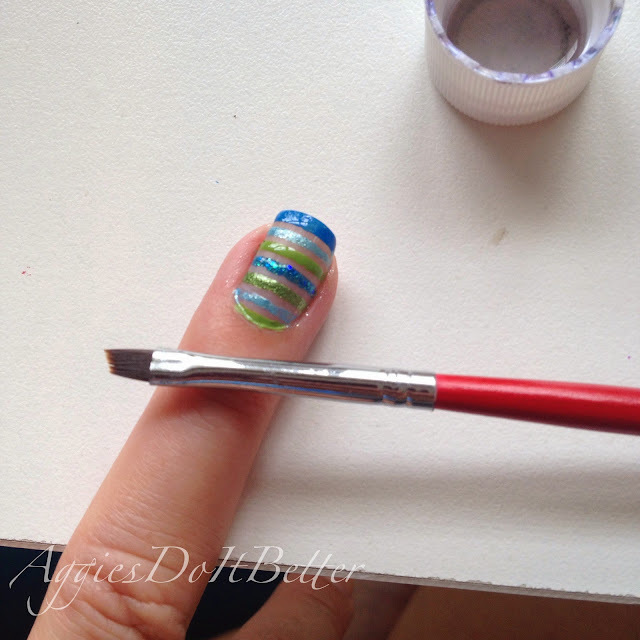 On the striped finger, all I did was place pieces of striping tape on my bare nail and then use my smallest dotting tool to fill in the lines, removing the tape as I went down. Then I did use a topcoat to seal it all up. From the top the colors are: All Zoya: Tilda, Rebel, Meg, Muse, Tilda, Rebel, Ling. I forgot to use Stassi in my stripes, oops! As I pulled off the tape, the lines weren't as clean as I would like, and because I was trying to fill in such a small space at the base of the nail (never again) I had a ton of my polish in my cuticle-ugh! I started using the regular brushes I use for clean up, ELF brushes, and then decided to reach for the angled brush in the set I received from Winstonia Store. Holy smokes, yall, it's awesome! It's angled like I prefer and the edge is SUPER sharp...wow I am impressed. I think it will become my new go to clean up brush! The ELF brushes are good, but they are kind thick. This razor sharp edge also worked for cleaning up the lines in between the lines, do yall know what I mean? Definitely a plus. 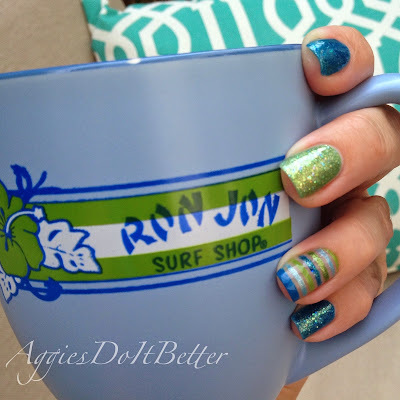 When I was done taking pictures I had a thought...OMG this totally matches my new Ron Jon mug! I went and grabbed it, and look! Totally matches! So weird right, totally a coincidence. Yay! Love this blue and green combo! Almost teal! Lovely! 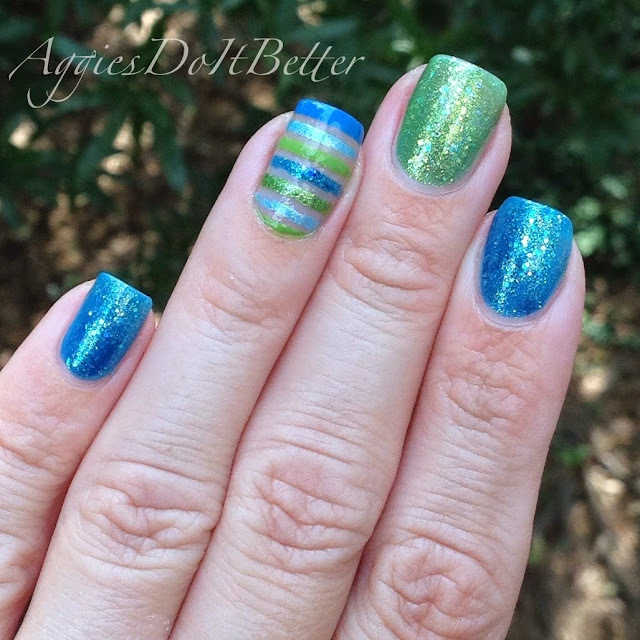 Glad I clicked (from Nail It! Mag) even though I am a Longhorn!